Enter your artwork in the Annual Rt. 66 Art Show and Sale. This annual art exhibition is held in conjunction with the Sapulpa Main Street Route 66 Blowout the first weekend in June. Area artists are encouraged to show and/or sell their works. All ages are represented for both amateur and professional in several categories. It is the mission of Sapulpa Arts to promote the arts and humanities in the Sapulpa area so that the artistic heritage and creativity of all people may find expression, growth and visibility. In keeping with our mission, Sapulpa Arts wants to recognize the quality and merit of the artwork entered, but also encourage the artists at all levels. ALL adult work must be securely framed and securely wired for hanging. Work must be dry. Drawings should be under glass or Plexiglas. Each entry must have an entry form attached on the upper right back side of the piece. 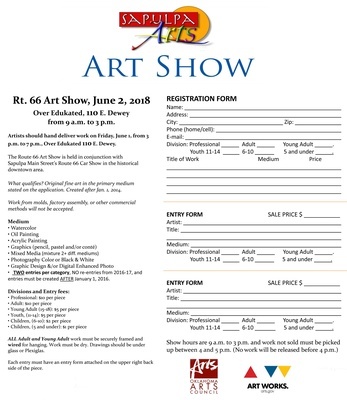 Show June 1, 2018, 9 a.m. to 3 p.m.
Art Drop-off and registration is May 31, 3 to 7 p.m. This is a non-profit event. Funding is made possible with private donations and entry fees.